Singer-songwriter Carole King, Star Wars creator George Lucas and actress Cicely Tyson descended on Washington on Sunday to be feted for their contributions to the arts as the latest recipients of the coveted Kennedy Center Honors awards. 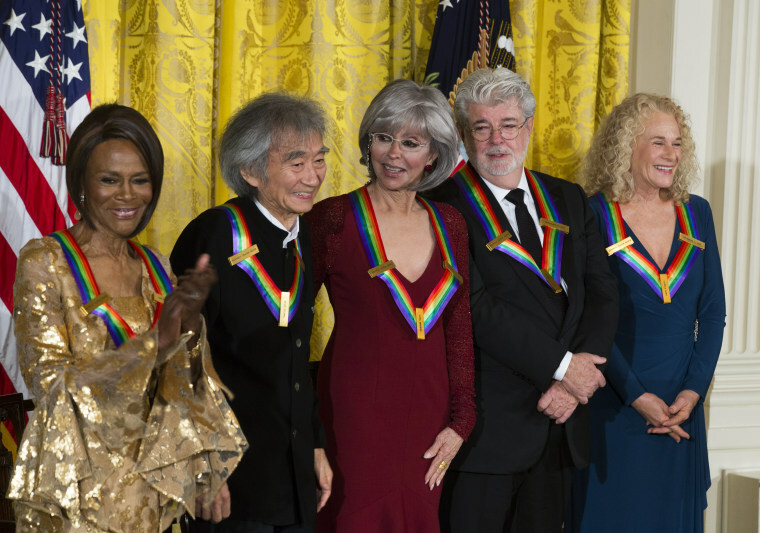 Joined by actress Rita Moreno and conductor Seiji Ozawa, the artists began a night of celebrations at the White House, where President Barack Obama lauded their accomplishments over decades. "Tonight, we honor five artists who helped tell the story of the first American century through music, theater, and film, and by doing so, helped to shape it," he said to a room filled with stars including actress Julie Andrews, singer Usher, and film director Steven Spielberg. The president peppered his remarks with humor and praise, noting Ozawa had ruined a career as a pianist by breaking his fingers playing rugby, only to become a great conductor. He praised Lucas for having raised America's children thanks to the Star Wars films. "Without him, movies would not look as good or sound as good as they do today. Spaceships might still fly around the screen with little strings attached to them," he said to laughter. The day was overshadowed in some ways by the recent attacks in California and Paris. Obama was expected to miss the first half of the Kennedy Center performance itself to make a rare address to the nation from the Oval Office. The artists kicked off the festivities on Saturday night at the State Department with a dinner and toasts from their friends and contemporaries. "I am still in shock," said Tyson, an award-winning actress on Broadway and in television, when asked how she felt about receiving the award. "I consider this tantamount to being honored by the queen." King, a Grammy award winner known for hit songs such as "Will You Still Love Me Tomorrow" and "Natural Woman," said she relished being part of the Kennedy Center Honors club. "The company that I'm in -- not only this evening but the historic company that I'm in, it's extraordinary," she told reporters. Lucas joked that he was happy to be getting the award instead of presenting one as he did once for Steven Spielberg. "(For) this one I don't have to say anything," he said. Moreno, who earned an Oscar in 1962 for her performance in the film adaptation of "West Side Story," highlighted her heritage. "It feels terrific," she said. "All my family and friends brought the Puerto Rican flag."